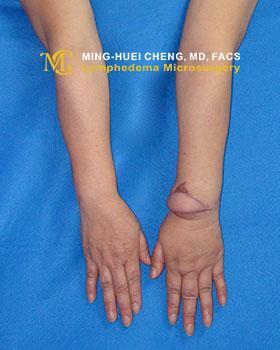 At 2- months follow-up, the circumferential reduction rates of the affected limb circumference without the use of compression garments were 27% and 10% above and below the elbow, respectively. 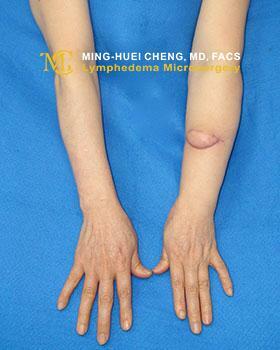 At 12- months follow-up, the circumferential reduction rates of the affected limb circumference without the use of compression garments were 36% and 15% above and below the elbow, respectively. 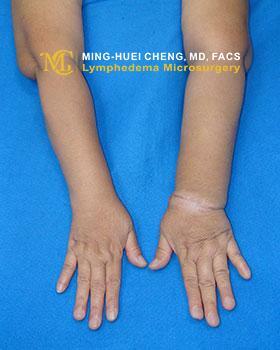 The skin paddle in the wrist was de-epithelialized and the left upper medial arm was subjected to liposuction at 14 and 27 months. 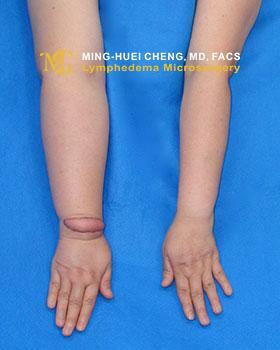 At 36- months follow-up, the circumferential reduction rates of the affected limb circumference without the use of compression garments were 60% and 10% above and below the elbow, respectively. 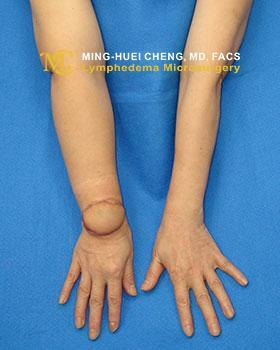 At 72- months follow-up, the circumferential reduction rates of the affected limb circumference without the use of compression garments were 100% and 50% above and below the elbow, respectively. 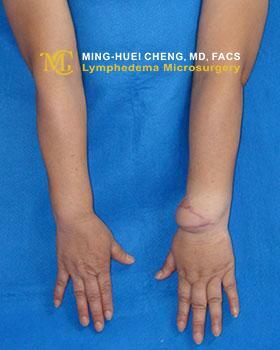 At 3- months follow-up, the circumferential reduction rates of the affected limb circumference without the use of compression garments were 38% and 25% above and below the elbow, respectively. 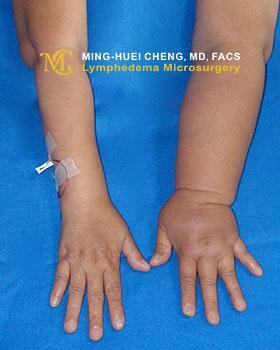 At 6- months follow-up, the circumferential reduction rates of the affected limb circumference without the use of compression garments were 32% and 15% above and below the elbow, respectively. 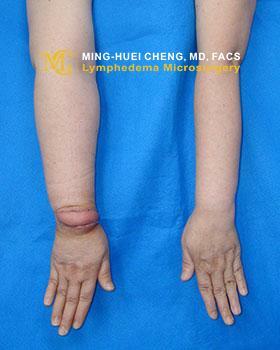 At 12- months follow-up, the circumferential reduction rates of the affected limb circumference without the use of compression garments were 30% and 15% above and below the elbow, respectively. 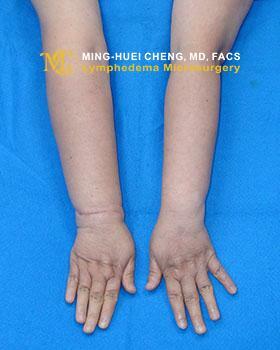 The skin paddle in the wrist was de-epithelialized and the left upper medial arm was subjected to liposuction at 14 months. 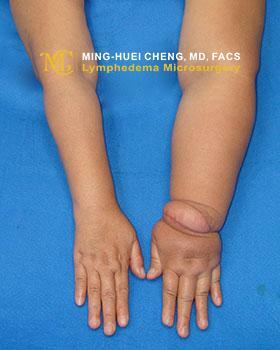 At 18- months follow-up, the circumferential reduction rates of the affected limb circumference without the use of compression garments were 90% and 40% above and below the elbow, respectively. 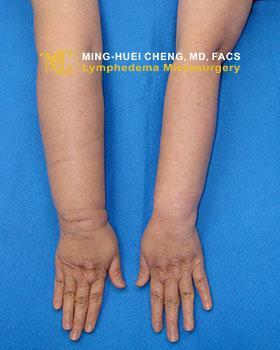 At 22- months follow-up, the circumferential reduction rates of the affected limb circumference without the use of compression garments were 100% and 35% above and below the elbow, respectively. 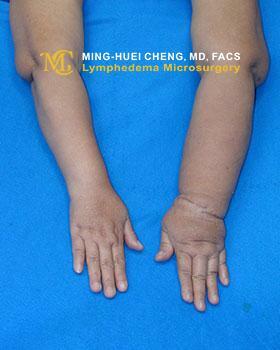 At 12- months follow-up, the circumferential reduction rates of the affected limb circumference without the use of compression garments were 40% and 15% above and below the elbow, respectively. 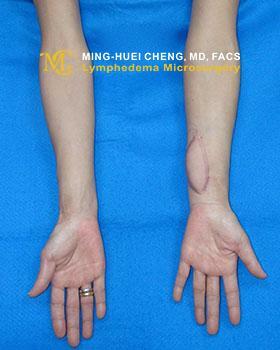 The skin paddle in the wrist was de-epithelialized and the left upper medial arm was subjected to liposuction at 14 months. 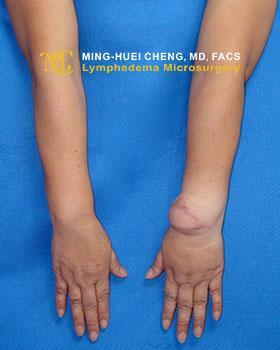 At 21- months follow-up, the circumferential reduction rates of the affected limb circumference without the use of compression garments were 70% and 30% above and below the elbow, respectively. 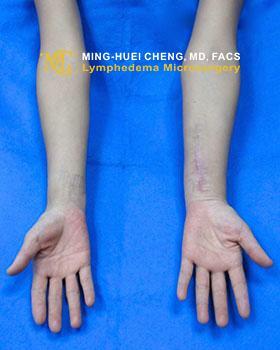 At the 6-months follow-up, vascularized submental lymph node flap transfer to the wrist had significantly improved the patient’s symptoms and extremity tightness. 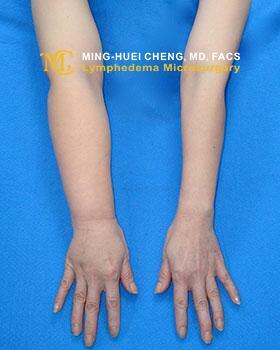 The circumferential reduction rate was 20% above the elbow and 15% below the elbow without the use of a compression garment. 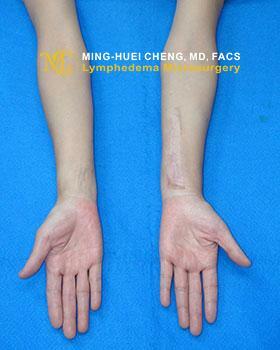 The patient received a revision surgery consisting of the de-epithelialization of the skin paddle in the wrist and liposuction for the left upper medial arm 14 months after surgery. 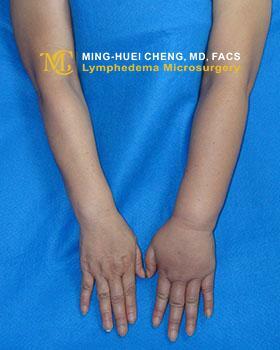 At the 20-months follow-up, the reduction rate was 53% above the elbow and 15% below the elbow without the use of a compression garment. 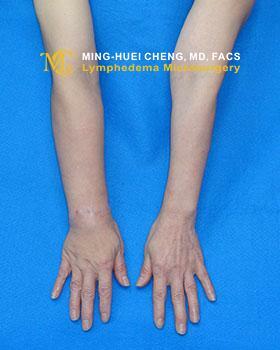 At the 24-months follow-up, the reduction rate was 60% above the elbow and 50% below the elbow without the use of a compression garment. 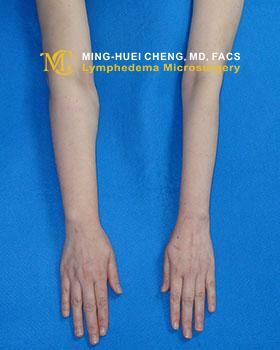 At the 33-months follow-up, the reduction rate was 50% above the elbow and 25% below the elbow without the use of a compression garment. 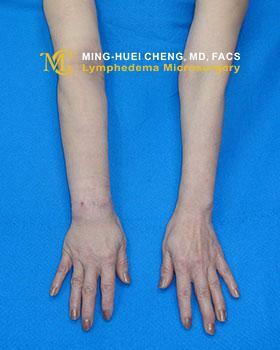 A 59-year-old patient with grade II breast cancer-related lymphedema of the left upper extremity for 12 months after modified radical mastectomy, axillary lymph node dissection, and radiation. 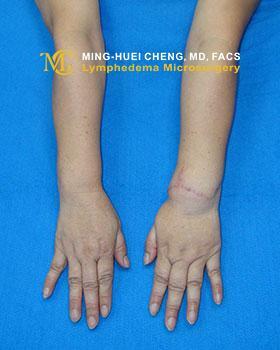 She developed 2 episodes of cellulitis per year and was refractory to conservative decongestive therapy. 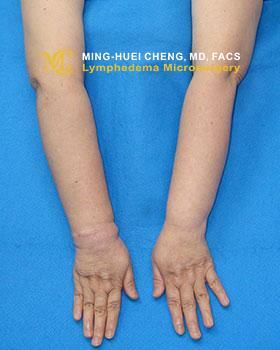 At the 3-months follow-up, vascularized submental lymph node flap transfer to the wrist had significantly improved the patient’s symptoms and extremity tightness. 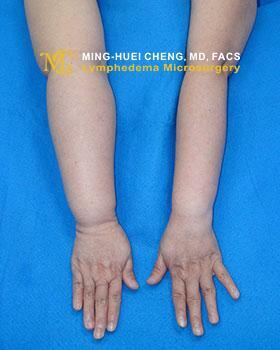 The circumferential reduction rate was 22% above the elbow and 25% below the elbow without the use of a compression garment. 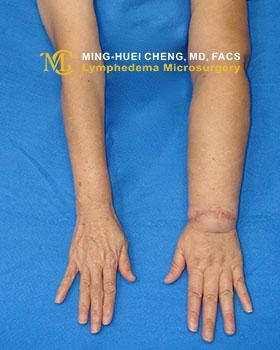 At the 6-months follow-up, the reduction rate was 35% above the elbow and 25% below the elbow without the use of a compression garment. At the 12-months follow-up, the reduction rate was 30% above the elbow and 20% below the elbow without the use of a compression garment. 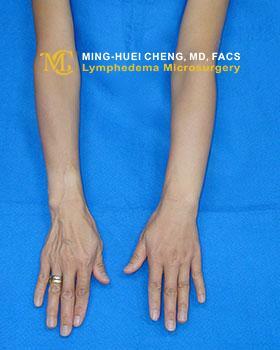 The patient received a revision surgery consisting of the de-epithelialization of the skin paddle in the wrist and liposuction for the left upper medial arm 14 months after surgery. At the 24-months follow-up, the reduction rate was 35% above the elbow and 30% below the elbow without the use of a compression garment. 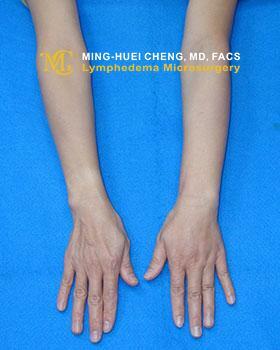 At the 38-months follow-up, the reduction rate was 35% above the elbow and 30% below the elbow. 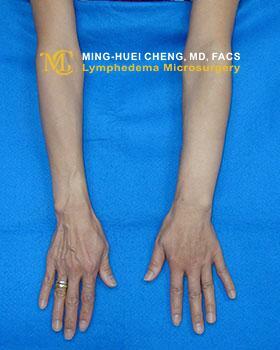 The patient was satisfied with the functional and cosmetic outcomes and did not wear a compression garment. 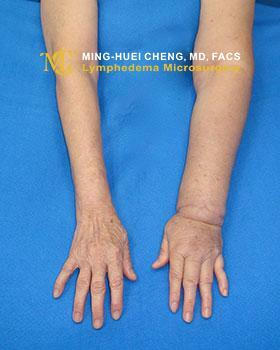 A 51-year-old patient with grade II breast cancer-related lymphedema of the left upper extremity for 6 months after mastectomy, axillary lymph node dissection, and radiation. 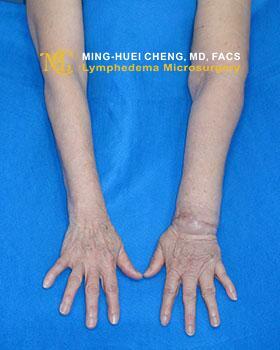 She developed 1 episodes of cellulitis per year and was refractory to conservative decongestive therapy. 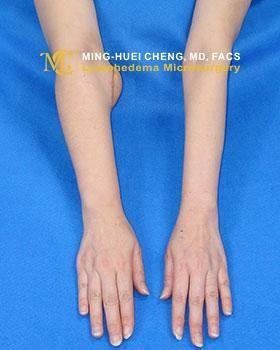 At the 12-months follow-up, the reduction rate was 50% above the elbow and 33% below the elbow without the use of a compression garment. 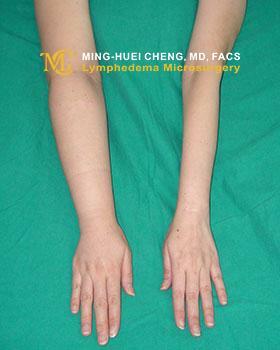 At the 20-months follow-up, the reduction rate was 50% above the elbow and 77% below the elbow without the use of a compression garment. 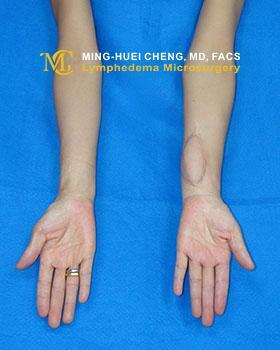 The patient received a revision surgery consisting of the de-epithelialization of the skin paddle in 24 months after surgery. 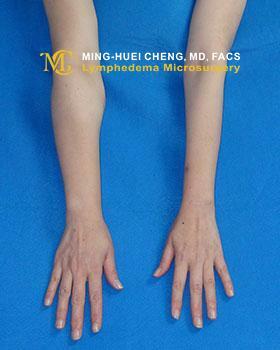 At the 36-months follow-up, the reduction rate was 50% above the elbow and 50% below the elbow without the use of a compression garment. 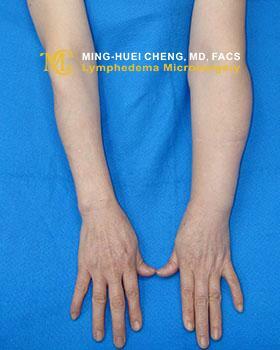 At the 40-months follow-up, the reduction rate was 70% above the elbow and 75% below the elbow without the use of a compression garment. 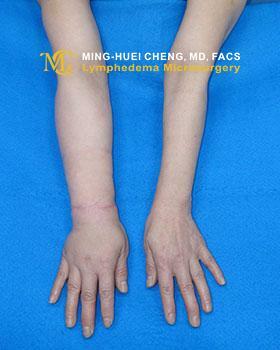 A 59-year-old patient with grade II breast cancer-related lymphedema of the left upper extremity for 18 months after modified radical mastectomy, axillary lymph node dissection, and radiation. 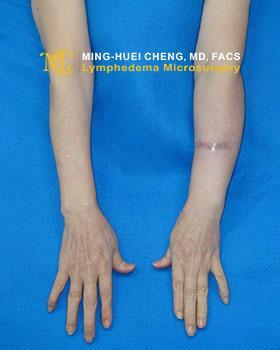 She developed 2 episodes of cellulitis per year and was received non-vascularized lymph node transfer by other doctor on left elbow, and refractory to conservative decongestive therapy. 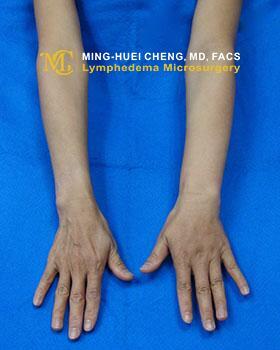 At the 3-months follow-up, the reduction rate was 10% above the elbow and 23% below the elbow without the use of a compression garment. 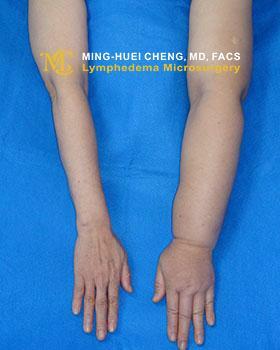 At the 10-months follow-up, the reduction rate was 20% above the elbow and 30% below the elbow without the use of a compression garment. 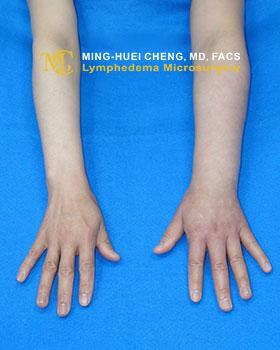 The skin paddle in the middle forearm was de-epithelialized and the left upper medial arm was subjected to liposuction at 14 months. 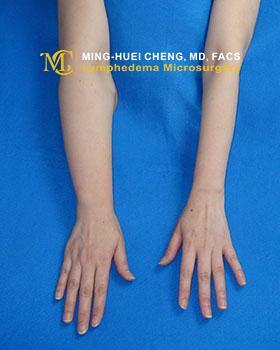 At the 20-months follow-up, the reduction rate was 100% above the elbow and 42% below the elbow without the use of a compression garment. 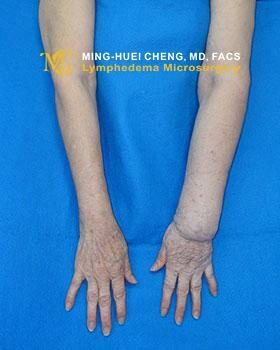 This is a 46-year-old female who had suffered from breast cancer-related lymphedema of the right upper extremity for 2 years after mastectomy, axillary lymph node dissection, and radiotherapy. 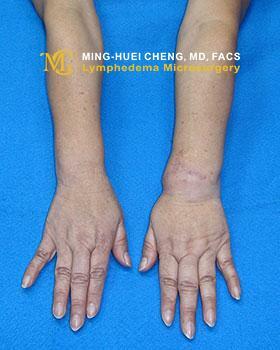 She developed one episode of cellulitis per year with the use of compression garments. 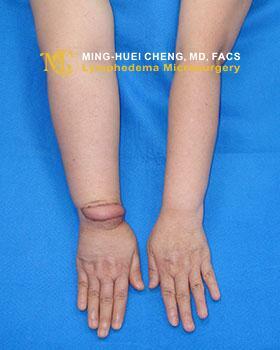 At 3- months follow-up, the circumferential reduction rates of the affected limb circumference without the use of compression garments were 20% and 15% above and below the elbow, respectively. 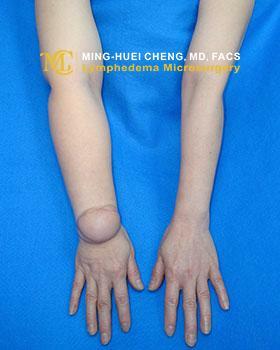 At 24- months follow-up, the circumferential reduction rates of the affected limb circumference without the use of compression garments were 37% and 20% above and below the elbow, respectively. 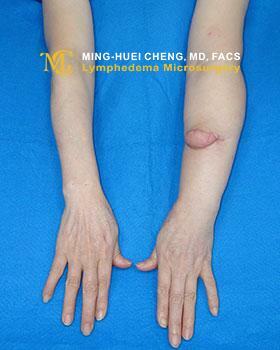 At 38- month follow-up, the circumferential reduction rates of the affected limb circumference without the use of compression garments were 40% and 25% above and below the elbow, respectively. 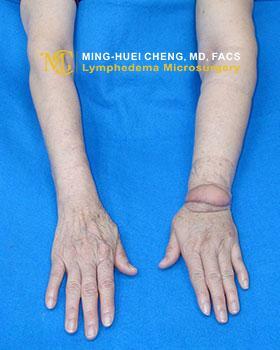 At 70- month follow-up, the circumferential reduction rates of the affected limb circumference without the use of compression garments were 75% and 50% above and below the elbow, respectively.